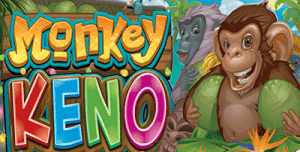 Monkey Keno is a safari themed keno game brought to us by Mahi Gaming in collaboration with Microgaming and Quickfire. Find out more about this fun, animated online keno game and the best casinos to play Monkey Keno for real money bets. Monkey Keno is available at Emu Casino, one of our top rated sites for Aussies to play online keno and other real money games. You’ll find it either by entering the title into Emu’s search engine or under the ‘Other Games’ category. Monkey Keno is an instant-play game which is available directly over your Web browser with no downloads required. Emu Casino welcomes new players with $3 for free, with no deposit required. If you like what you see and move on to make a real money deposit of your own, Emu will match your first three deposits by up to $300. Deposits can be made at Emu Casino in AUD using Visa, MasterCard, Skrill, Neteller or Paysafecard, with all financial transactions protected by 256 Bit SSL (Secure Socket Layer) digital encryption security. 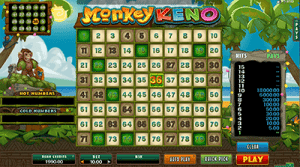 Monkey Keno follows the standard format of traditional keno, only it has undergone a safari theme to make it much more vibrant and engaging. It features a standard keno board of 80 numbers, but the board is set against a colourful jungle where a bunch of cheeky monkeys stand to the side of the screen waiting to shake the palm tree and throw coconuts at their keno picks. To play, simply set the size of your bet and click the keno board to select anywhere up to 15 numbers. Alternatively, hit the Quick Pick button to have the computer select your picks on your behalf. Minimum bets in Monkey Keno start at just $0.10, with the maximum bet capped at $10.00 per game. An auto-play function also allows you to pre-set up to 100 games in a row with the click of a button. Once you hit the play button, the monkeys throw their coconuts at 20 random numbers, determining the winning picks. Depending on the amount of numbers you choose, there’s a minimum you’ll need to hit in order to score a win. For example, if you pick the maximum of 15 numbers, you’ll need to match at least three to win a payout. The pay table sits to the side of the board and is automatically updated to suit the size of your wager and the amount of numbers you pick, so you’ll always know what you stand to win. There are no bonus rounds in Monkey Keno, however the game does include a Hot and Cold feature, where the top 10 most frequently and unfrequently drawn numbers are listed to the side of the game board. If you’re keeping an eye on your gambling behaviour, you can also click the stats button in the bottom right hand corner of the screen to view the gaming statistics of your current session, including the amount of time you’ve spent playing, how many games you’ve played and the amount of your highest wins. Is there a strategy to use in Monkey Keno? When playing any form of keno, whether online or offline, the most important thing to remember is keno is strictly a game of chance and there’s nothing you can do to influence your chances of winning. While you can view our strategy pages to have a look at some recommended keno tips, always remain in control by understanding keno is a game of luck which should always be played in a fun and responsible manner. In Monkey Keno, the more numbers you pick and match, the higher the amount you can win. Your wager will also cost you the same amount whether you bet on one number or 15 numbers. While technically this means you might as well pick the maximum of 15 numbers as this will give you a higher chance to win the big bucks, you’ll also need to match at least three numbers to win anything at all, unlike picking just five numbers where you’ll only need to match one to form a win. The amount of picks you choose to make and the keno strategy you wish to employ comes down entirely to personal choice. To see what works for you, your best bet is to give Monkey Keno a try for free in practice mode. You can sample what it’s like to bet on a couple of numbers or the maximum amount of numbers and then move on to play for real money knowing what’s comfortable for you. Sign up to play Monkey Keno at Emu Casino and claim $3 for free with no deposit required. You’ll also get access to other fun keno variants including Jackpot Keno, Keno Kick Off, Keno Lab, Kenotronic and more.